It's 2015 and renewed licence terms for the broadcasting companies operating services on Channels 3, 4 and 5 have come into effect. Gone are the days when ITV licence changes meant midnight handovers from one broadcasting company to another; indeed this time, most of the changes have already occurred on-screen, but from the stoke of midnight the former dual Wales and Wales region came to an end, as Ofcom paperwork finally caught up with on-screen reality. ITV, STV and UTV retain the right to broadcast services on Channel 3 for another 10 years in return for a commitment to provide public service broadcasting. Similar arrangements apply to Channel 4 and Viacom's Channel 5. 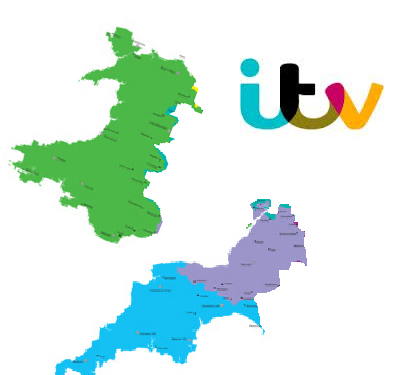 Just over twelve years after the "HTV" branding for the dual West and Wales region was abolished and on-screen the two ITV regions drifted apart, and around a year after new regional news commitments for ITV regions were introduced, ITV West is now formally part of the extended ITV West Country region, nearly two years after Ofcom consulted over the redrawing of ITV's regional boundaries. Hidden away on the Ofcom website, a regulatory notice issued on 19th February 2014 confirmed a variation to the West and Wales licence, which finally came into effect today, stating that the Wales and West licence holder's role would now be "to provide the regional Channel 3 service for Wales". A similar notice confirms the official incorporation of the ITV West region into the new "West Country" region effective today. In fact, ITV in the South West has been combined since 2009, with West and Westcountry regional news being provided out of Bristol for both ITV regions, following the closure of ITV's regional news service from Plymouth. And ahead of ITV's Channel 3 licence renewal, in 2013 the broadcaster and Ofcom agreed to new regional news commitments - as reported by a516digital, which have already been put into action across the ITV regions. This means that the combined ITV West and Westcountry region, known simply as "West Country" has to provide a separate regional news service for what are from today officially two sub-regions - reversing some of the draconian changes introduced in 2009, albeit that all regional news is still presented from Bristol. ITV has to provide 20 minutes of separate news at 6pm for Cornwall, Devon and West Dorset as well as for Bristol, Gloucestershire, Somerset and parts of Wiltshire, plus 10 minutes of content that can be shared across ITV regions. ITV Cymru Wales will continue to broadcast 5 hours and 30 minutes of regional output on average each week. Today, the regulations have finally caught up with what viewers actually see on-screen. But the redrawing of the ITV regional map still only applies to standard definition ITV. For HD viewers, Wales and West Country viewers continue to receive ITV Central (West), thanks to both regions belonging to a large, so-called "macro" advertising region which goes back to when Carlton owned regional ITV stations Central, HTV and Westcountry TV. A separate ITV HD region for Wales is licenced by Ofcom, but there's been no public announcement about when this service will actually launch. Meanwhile regional news provision across the West Country and Wales, as dictated by the renewed licences, remains for standard definition viewers only. With new ways of accessing public service broadcaster (PSB) output such as via HD simulcasts, it's surely a question of how long will it take before Ofcom's regulatory paperwork once again catches up to reflect reality?